The Hebrew word Chesed (חסד) is the root word upon which the name Hasidism is based. Chesed (“Kindness”) is the fourth Sephirah on the tree of life in the Kabbalah of Judaism. It is given the association of kindness and love, and is the first of the emotive attributes of the Sephirot. Chesed is the fourth of the ten sefirot, and the first of the emotive attributes within Creation. 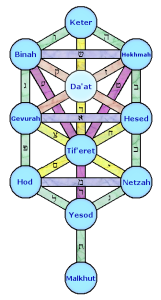 Chesed appears in the configuration of the sefirot along the right axis, directly beneath chochmah, and corresponds in the tzelem Elokim to the “right arm”. Chesed is associated in the soul with the desire to embrace all of Creation and bestow upon it goodness. As the expansive force which impels the soul to connect with outer reality, chesed inspires, and thus implicitly accompanies, all the other expressions of emotive force which succeed it in the soul. Chesed is the first “day” of Creation. On it was created the goodly light of loving-kindness for all. The first day is called in the Torah “the day of one” (yom echad) (Genesis 1:5). The Divine consciousness of this day is that all of Creation is one as embraced, in love, by the Oneness of the Creator (echad, “one” = 13 = ahavah, “love”). Of this day is said: “Day[s] God commands His loving-kindness” (Psalms 42:9). The unique form of the word “day[s],” yomam, implies, in the words of the Zohar: “a day that accompanies all days.” From this we learn that the first day, the day of loving kindness, “accompanies” and radiates its light to all the other days of Creation. Chesed = 72 = 2 x 6 squared. 6 squared represent the perfected state of the six emotions of the heart which correspond to the six days of Creation. The 2 x 6 squared represents the perfect love and harmony within Creation, “as one’s face is reflected in water [the basic physical symbol of chesed] so is the heart of man to man” (Proverbs 27:19). The Zohar speaks of 72 “bridges” of love (corresponding to the 72 hidden Names of God) that connect together, in perfect harmony, all of created reality. The spiritual state identified in Chassidut as corresponding to the sefirah of chesed is that of ahavah (love).